(Reuters) - A jaguar clawed an Arizona woman who climbed over a barrier to take a picture at the Wildlife World Zoo near Phoenix, officials said, and the zoo assured animal lovers the big cat would not be put down. Cellphone video of the incident showed at least one gash on the woman's left forearm as she writhed on the ground in pain on Saturday. 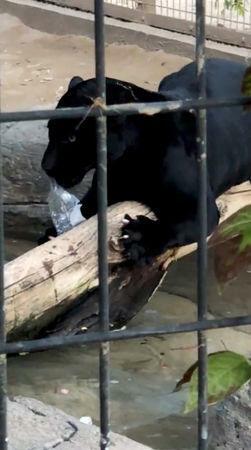 Wilkerson's mother distracted the jaguar by pushing a water bottle through the cage, and Wilkerson said he pulled the woman away. Cellphone video later showed the animal chewing on a plastic water bottle.